The rate of failed epidural anesthesia ranges from 13% to 47%. Anatomical catheter location, patient position, puncture site, approach type, localization of the epidural space, catheter insertion and fixation, test dose application, equipment used, local anesthetic dose or volume, choice of local anesthetic, and addition of opioids and epinephrine are all the factors that influence the success of epidural anesthesia. Here, we report a failed epidural catheterization due to kinking of the catheter tube. A 22-year-old man who underwent laparoscopic acute appendectomy under general anesthesia without any complications needed to undergo surgical exploration because of hemorrhagic drainage during the postoperative period. As the patient was pale and cold, with a significantly reduced hemoglobin level, an emergency surgery was planned. Combined spinal epidural anesthesia was decided as the patient's fasting duration was not appropriate for general anesthesia. After appropriate preoperative preparation, combined spinal epidural anesthesia was performed at the L4–5 level via loss of resistance technique with saline, and 15 mg of 0.5% bupivacaine was injected intrathecally. The epidural space was entered at the 8th cm under the skin. 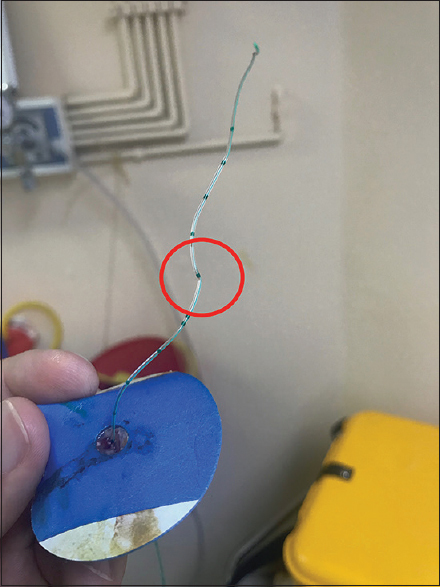 While inserting the epidural catheter through the Tuohy needle, resistance was felt. Telling the patient to take a deep breath, the catheter was pushed against the resistance, which was lost for 1 cm, and the catheter was pushed until the 14th cm. No check with a saline injection was made after fixing the catheter; however, aspiration was negative. The catheter was fixed and surgery was initiated after ensuring successful spinal anesthesia. After 3 h of surgery, the patient started to feel pain. The surgeon was warned to wait, and the level of spinal anesthesia was checked and found to be insufficient. On attempting local anesthetic injection through the epidural catheter, negative aspiration was noted but an abnormal resistance was felt. After another failed attempt, the epidural catheter connection point was checked and recapped, but no difference was noted. As a result of the failed catheterization, general anesthesia was administered with fast track intubation. No complications, such as vomiting and aspiration, were noted. After surgery, during extubation, an attempt was made to pull out the epidural catheter. The first few centimeters of the catheter came out easily, but then a resistance was felt. Applying a small force, the catheter was pulled out totally and a kink was observed at the 9th cm [Figure 1]. There are many examples of epidural catheter kinking under the skin in the literature.,, Hence, it is very important to check the epidural catheter after insertion using saline injection in addition to negative aspiration, to ensure proper functioning. Hermanides J, Hollmann MW, Stevens MF, Lirk P. Failed epidural: Causes and management. Br J Anaesth 2012;109:144-54. Bhakta P, Olteanu DS, Zaheer H. 90 degrees kinking of Vygon epidural catheter. J Anesth 2017;31:796. Aslanidis T, Fileli A, Pyrgos P. Management and visualization of a kinked epidural catheter. Hippokratia 2010;14:294-6. Sexton AJ. Double kinking of a thoracic catheter within the epidural space. Anaesth Intensive Care 2012;40:732-3.